This is perhaps the most unusual book I’ve read in a while. I’ve tried to nail down a better adjective, but unusual always comes back around – unusual and unique. I bought the book while I was in Santa Fe with Michele, and after reading the first three pages, I wanted to read more. Of course, the first three pages did not prepare me for the next 477. Frankly, I’m not even confident I could write an informative synopsis, but what’s the harm in trying? Written in first person and present tense, we go alongside Harold Silver whose life used to be predictable and mundane. But after his brother, George, commits a violent crime, Harry’s day-to-day becomes one impossible situation after another. He becomes responsible for his niece and nephew, whom he hardly knows, as well as aging parents that aren’t his own. The web he weaves through internet sexcapades don’t help matters, and then the cat has a mess of kittens. All the mediocre college professor really wants to do is finish his research on Richard Nixon and forget his brother ever existed. Buying him an iPad was a really wrong move. Who knew you could start so much trouble through Amazon? The book spans one year exactly, and after 365 days have passed, Harry’s life is on completely different trajectory. 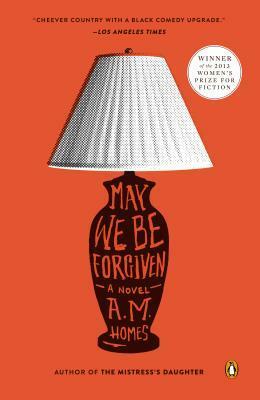 May We Be Forgiven is a dark comedy – emphasis on dark – and it earned A.M. Homes the 2013 Women’s Prize for Fiction. A note about the cover: The first image reflects the cover of the book I own. However, I have to say the updated version is pretty clever too. You will understand the significance of both the lamp and the canned cranberry sauce within the first ten pages. I would say the first chapter, but there are no chapters. Did I mention this book is odd? The fact that I’m still thinking about it tells me something important about the author. Despite the number of times I shook my head while reading it, or turned to Chuck and said, “This book is so weird,” the story left an impression on me, and in the arena of art, that’s a good thing. Whether or not you like a piece of art is almost irrelevant. If you’re still talking about it weeks after seeing it (or reading it), perhaps the artist (or writer) did her job. After all, where’s the inspiration in indifference? Buy May We Be Forgiven here. The text body font is Museo Sans and the headlines are Museo Slab.